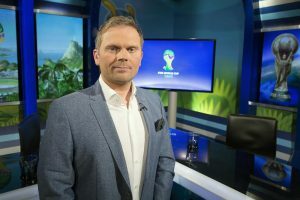 Made in Manchester has recruited Icelandic commentator Gudmundur Benediktsson to present a special programme for the BBC World Service looking back at 90 years of sports commentary. The footballer turned commentator was thrust into the spotlight when his excited reaction to Iceland beating England in Euro 2016 went viral. In Talking Sport: 90 Years of Commentary, Gudmundur, who presents Iceland’s equivalent of Match of the Day, hears from a number of legendary sports commentary names. The hour-long programme looks at how commentary emerged in Britain, America, India, Brazil and other parts of the world and includes contributions from legendary commentators like Murray Walker, Gerald Sinstadt and John Motson. There’s also a section looking at the rise of female commentators including an interview with Kass Naidoo, who became South Africa’s first black female cricket commentator. Ashley Byrne, creative director of Made in Manchester, said: "The programme covers lots of countries and lots of sports. People like Gudmundur who really bring commentary to life are a major part of the story and he was a delight to work with." Talking Sport: 90 Years of Commentary is timed to mark the anniversary of the BBC’s first football league commentary in January 1927, when Arsenal played Sheffield United at Highbury. It's one of over 30 broadcast production projects that the radio production company already has lined up for 2017. Byrne added: "Radio is thriving and MIM is making the most of it. We have some really exciting programmes in the pipeline for broadcasters here and around the world. We’re all looking forward to 2017 and to showing how production from the nations and regions of the UK can flourish and grow." Talking Sport: 90 Years of Commentary airs on the BBC World Service from 9-10am on Wednesday January 25th, and will also be available via the BBC Radio iPlayer.